Each year at Mangia we strive to provide the best in service, from the first phone call you make to our staff to the final dish put away at your event and every step in between. 2017 was no exception, and our calendar was marked with hundreds of events the showcased that special Mangia touch at each one. And like so many of you, our year also had some unforgettable moments and events that we will long look back on as highlights in our business. 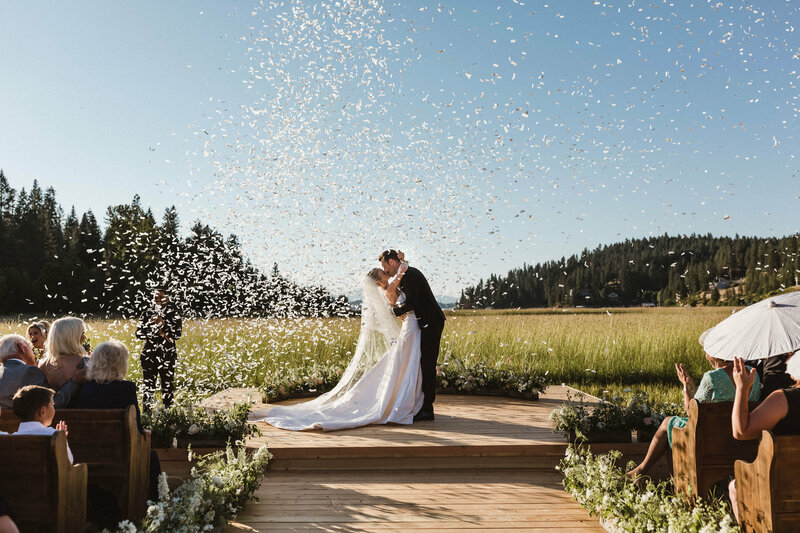 As we reflect on all of the special occasions we were able to celebrate with our clients, one of the biggest and most memorable was the Hough + Laich Coeur d’Alene Wedding. 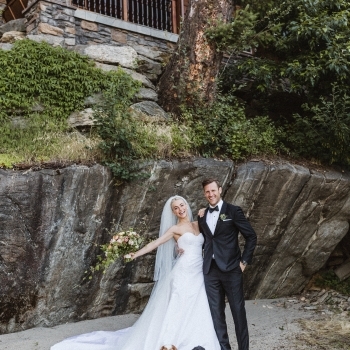 As the 4th of July celebrations were just getting put away, Mangia was gearing up for our biggest event of the summer: the wedding weekend celebrations of Dancing with the Stars host Julianne Hough and her husband, NHL player Brooks Laich. 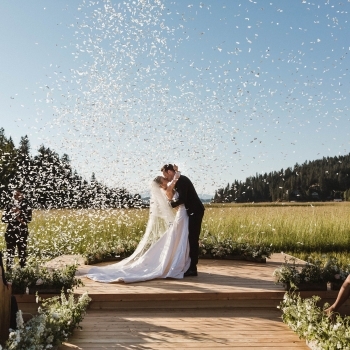 The Hough + Laich wedding took full advantage of the idyllic summer setting Coeur D’Alene offers and made their wedding day into a three-day celebration and gathering of friends and family. 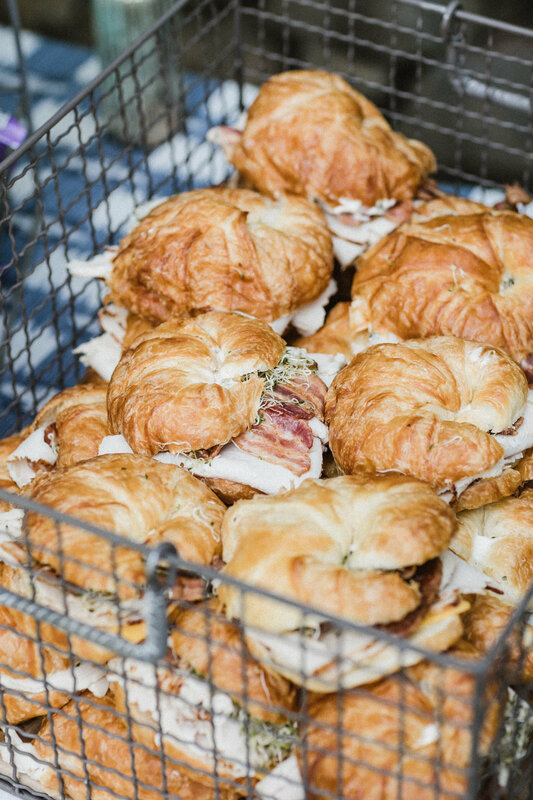 Mangia had the privilege of catering three events for the wedding party leading up to the big day on July 8th, which started with a welcome dinner on Thursday night, July 6th, at the Blackwell Hotel. 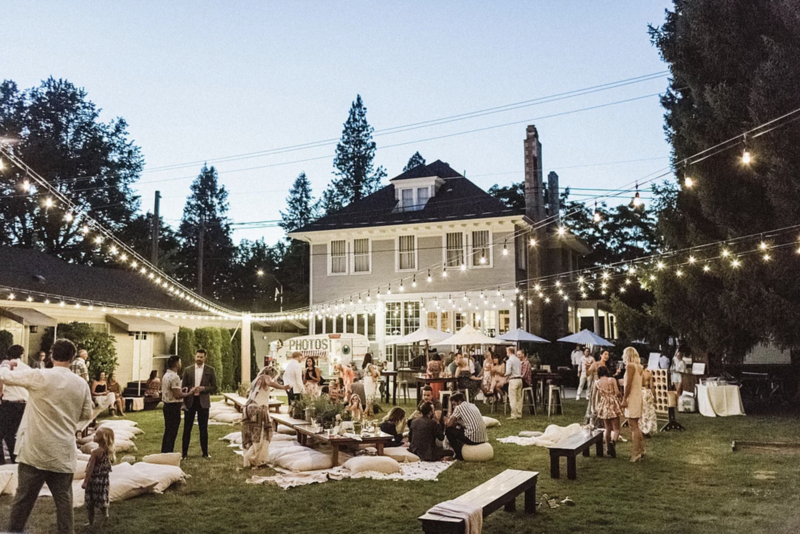 The Blackwell, originally built in 1904 and still one of Coeur d’Alene’s historic treasures, made the perfect backdrop for an outdoor dinner, where we served guests who sat on blankets and pillows at beautiful ground level wood tables. 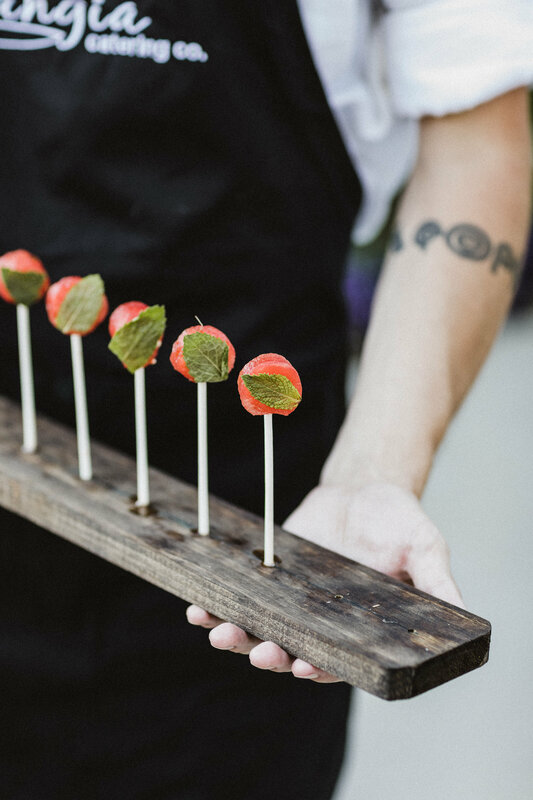 On the menu was a wood-fired pizza feast with a cocktail hour featuring passed hors d’oeuvres, including Watermelon-and-Mint Lollipops, Chicken-Parmesan Lollipops, Bacon-Wrapped Tiger Prawns with Spicy Tomato Relish and Smoked Salmon Canapés. 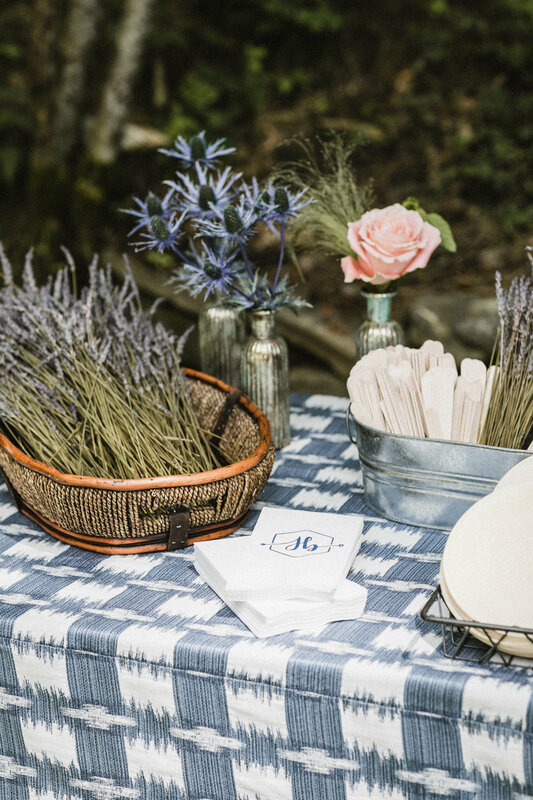 Guests were also treated to a charcuterie-and-antipasto display with a variety of artisan cured meats, breads, cheeses, spreads, seasonal fruit and grilled, chilled and pickled veggies. 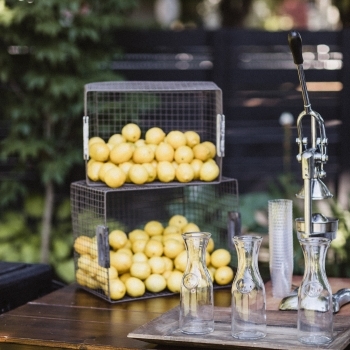 To drink, there was freshly squeezed lemonade with a choice of strawberry, raspberry or peach puree. 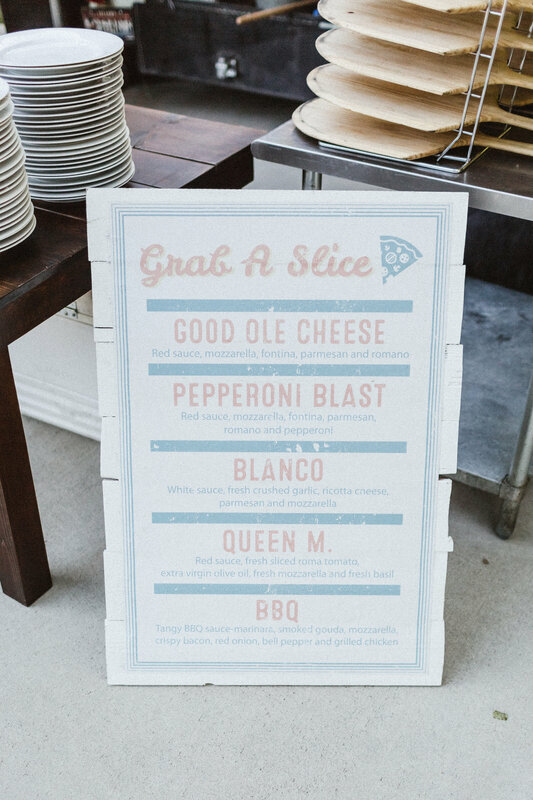 We served Blanco pizzas with ricotta, garlic, extra-virgin olive oil, parmesan and mozzarella; Barbecue Chicken with smoked gouda, bacon crumbles, red onion, roasted peppers and mozzarella; and Pepperoni Blast with red sauce, mozzarella, fontina, parmesan, romano, pepperoni and crispy pepperoni. 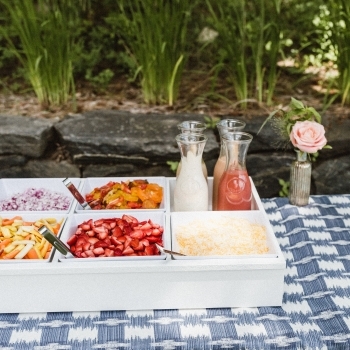 There were two kinds of salads, too – Late Summer Wedding Salad with local greens, grilled peaches, crispy pancetta, candied pecans, feta and sherry vinaigrette; and Chopped Salad with greens, romaine, tomato, red onion, cucumber, shredded carrot, herbed croutons and feta. On Friday the party gathered again at a private lake house for a day of sunshine and swimming on the lake. As any local knows, there are few places more beautiful than a summer day on Lake Coeur d’Alene, and the beauty combined with the festive atmosphere allowed everyone to let their inner child out and play. 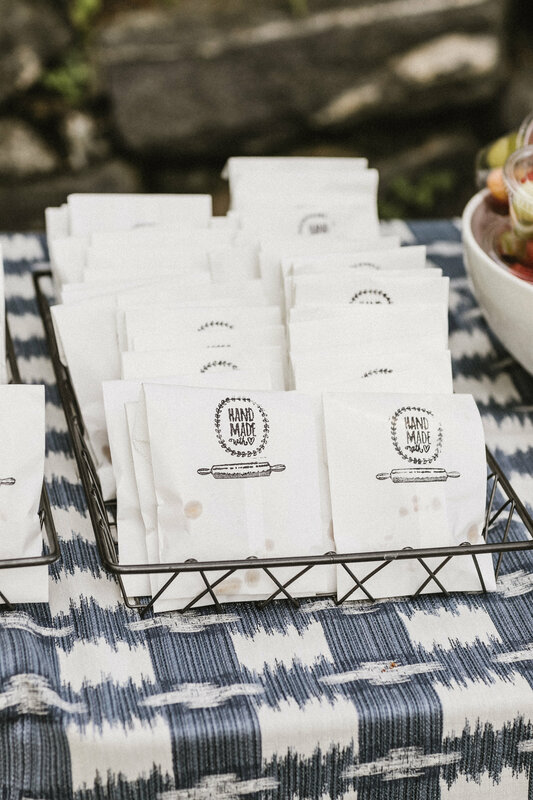 We served a gourmet salad station, Grand Marnier fruit cups, Tim’s Cascade kettle-style potato chips, and house-baked cookies and brownies to hungry guests as they enjoyed everything from relaxing in the sun to flips and cannonballs into the water. It was the perfect day to play before the hustle and bustle of the wedding the next morning. 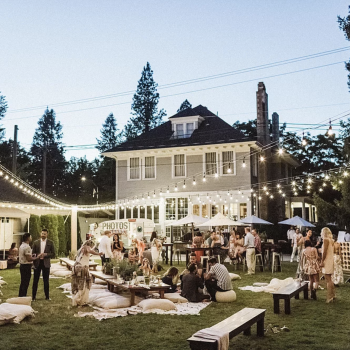 As the wedding party geared up for the main event on Saturday, we were welcomed into Jules and Brooks Coeur d’Alene home to prepare a gourmet breakfast for the wedding party. 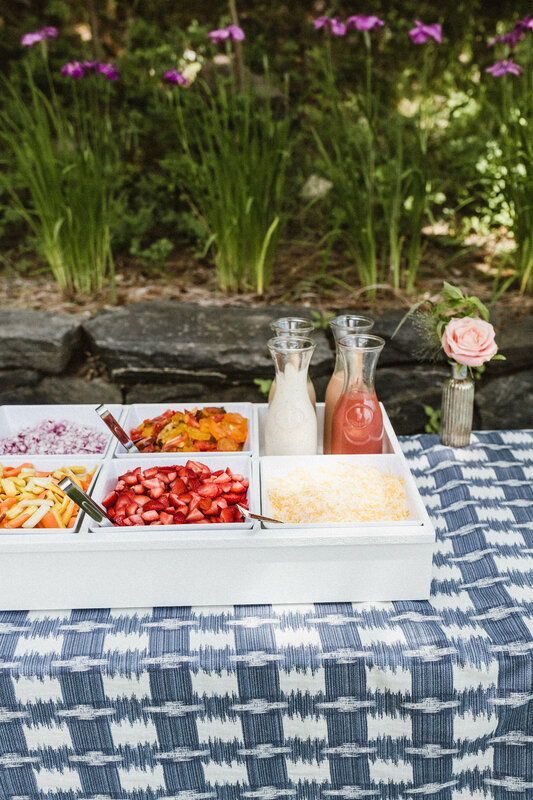 The breakfast featured a yogurt bar – with Greek, coconut, lemon and vanilla beat yogurts – and assorted toppings, including fresh berries and house-made granola. 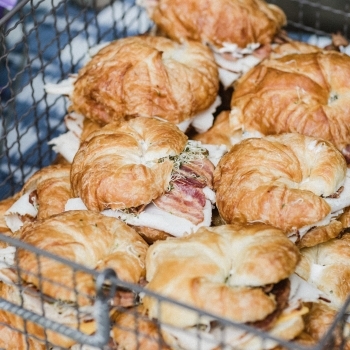 There were scrambled eggs, too – with creme fraiche, chives and sharp cheddar cheese, thick-cut, hickory-smoked bacon, sausage links, Idaho roasted potatoes, bagels, biscuits and pastries, and fresh fruit. 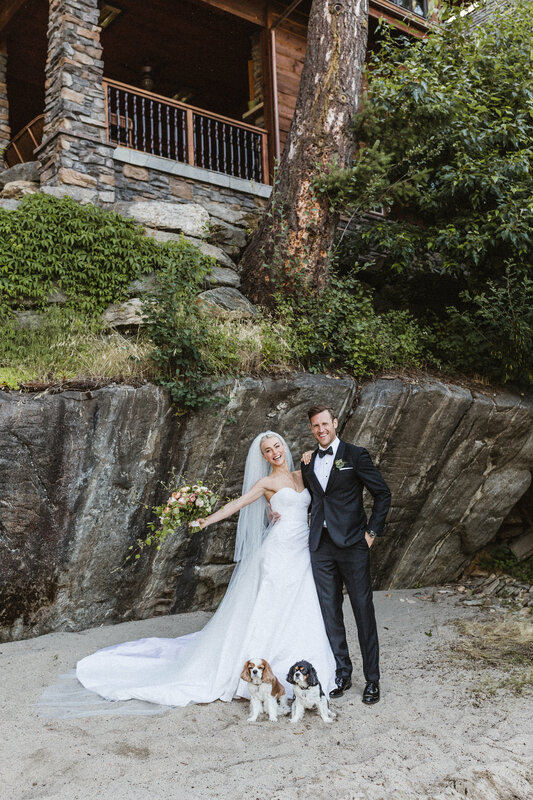 As we wrapped up our final time with the Hough + Laich wedding, we couldn’t help but feel both tired and grateful for the full weekend. We loved being a part of this celebrity event showcasing our region to the world, and we were told again and again what a great service we provided. Our reputation for great food and excellent customer service stood up with a spotlight on it, and we are very proud of our team for their hard work. 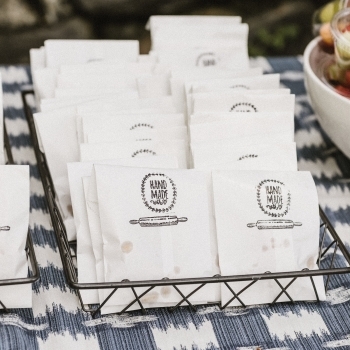 Tim, what was it like getting that phone call from Julianne and Brooks’ wedding planning team, and how did Mangia work with them on this event? This whole industry works on the foundation of relationships. Over the last eight years we have had the privilege of working with some of the most talented, creative professionals in the business. So of course, one of our relationships with a local planner, Abby (who has now moved to LA) had recommended us to J&B’s planning team and the rest is history. When was the first time you met Jules and her planning team and what was it like working with them on these events? Ohhh this was so long ago! I want to say it was fall of 2016. I was asked to attend a pre-planning meeting with Abby (she was General Manger/Planner for Blackwell Events, and later added to the Simply Troy CDA team) and the Simply Troy team in Coeur d’Alene as they were here scouting for a scenic location (which they totally found, see below). I was a little nervous, like the first day of school nervous! Troy and his team are big guns in this industry. 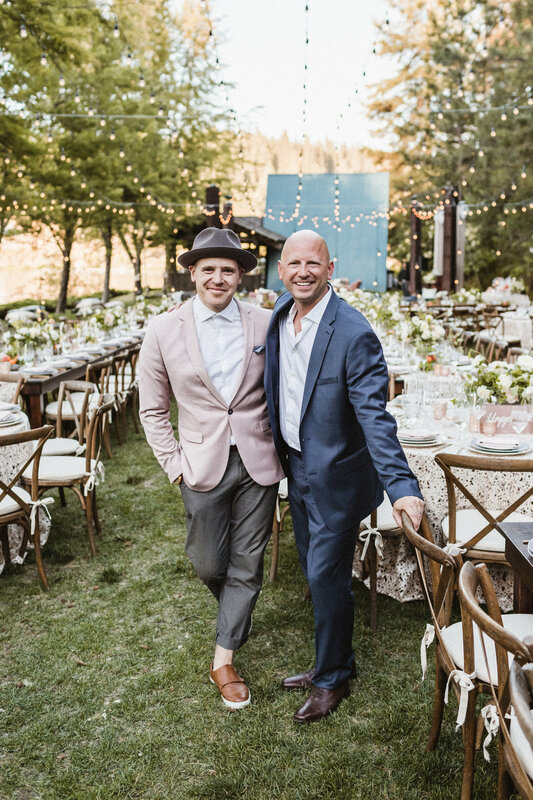 A quick google of him and review of his website, and there is no question that he is one of the go-to Hollywood planners in the industry. He’s done events for a quite the list of celebrities! As I walked into the hotel I was introduced to Troy of Simply Troy Events, alongside his Director of Operations Matty D, and as we finish those introductions Jules walks in and introduces herself! I was a little starstruck- I wasn’t informed that she would actually be at this meeting! We all sat down at a table in the lobby of the Blackwell Hotel. 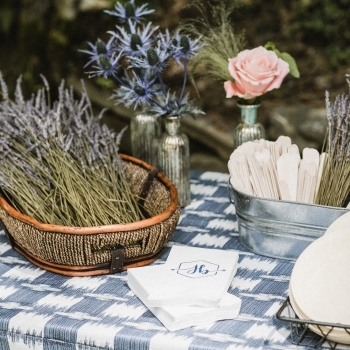 Abby had prepared some refreshments and Jules and her team started to unfold their vision of Jules & Brooks dream Coeur d’Alene destination wedding. I was so excited leaving the meeting! I could hardly contain my excitement but I was vowed to secrecy, only allowed to tell my wife. It was one of the hardest things to keep quiet, even my business partner was in the dark until about a month prior to the wedding. He was actually going Google crazy trying to figure out who was getting married that time of year and who had connections to our amazing little town of Coeur d’Alene. As I worked alongside of the Simply Troy team I quickly realized why J&B had put their trust and faith in them. They are such detailed, amazing and creative professional people. I spent the majority of my time working with Matty D as he was the guy figuring out all the logistics. Every good front man has a sidekick, and that is the case about Matty D to Troy! 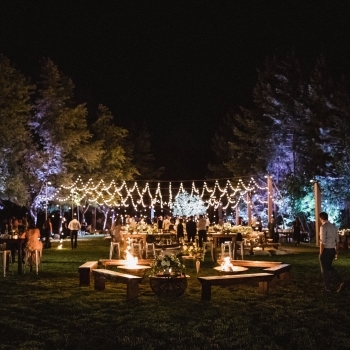 What were some of your favorite details about these wedding events? It’s so hard to pick out a favorite because ALL of the details were so amazing. Everything was so thought out and purposeful. One thing that I thought was really impressive is Jules and Brooks desire to use as many local creative professionals as possible. 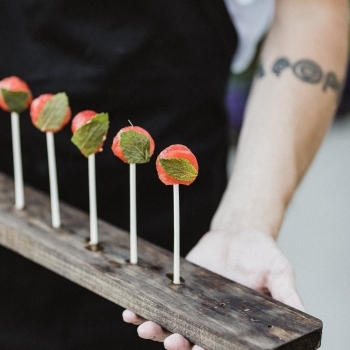 From the venues, caterer, to the ice cream, to the beer, it was a detail that even the guests noticed and appreciated. What was the Big Day like? 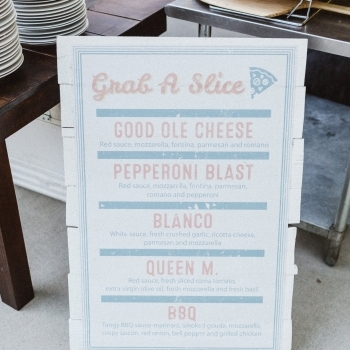 As mentioned, Mangia was tapped to handle all of the pre wedding events. However, I actually got to be a part of the wedding day team assisting Matty with all of the details. 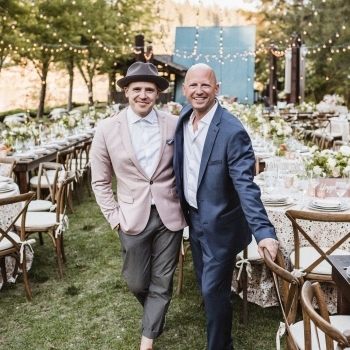 I couldn’t miss the opportunity to be a (working) fly on the wall to the biggest wedding ever to hit Coeur d’Alene! My day and long night consisted of helping direct vendors, setup, shuttling wedding guests from the ceremony to the reception site and of course jumping in to help the caterer with dinner service. Can we expect any more celebrity weddings in 2018 for Mangia? I couldn’t say 😉 Brooks Laich did ask if I wanted to move to LA to cook for them, but North Idaho is home. 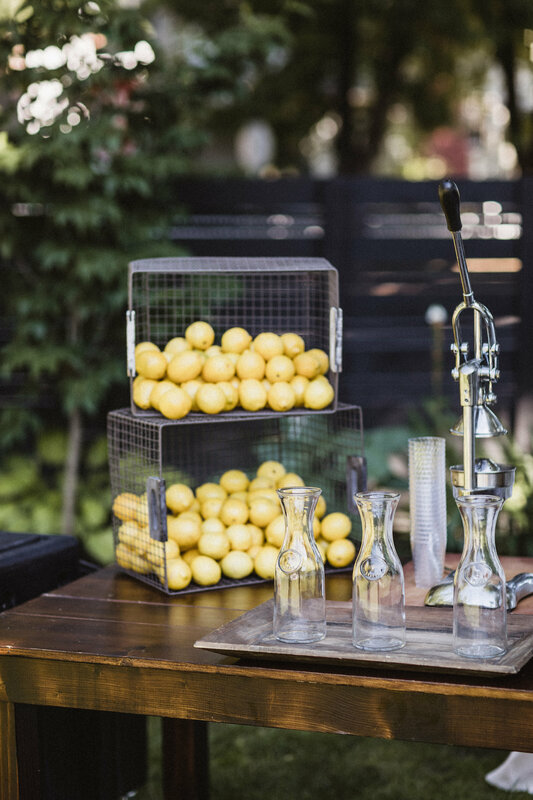 One thing is certain, our future clients will greatly benefit from our experience and the push of creativity and perfection that our team provided for these amazing wedding events. It has been another incredible year for Mangia, one marked with great opportunities and growth, and we are continually thankful for the incredible clients we are invited to work with. As we look forward to 2018, we are committed to serving the best and freshest food, staying up with the most innovative trends in the industry, and offering each and every client the excellent service with integrity that makes Mangia Catering what it is. 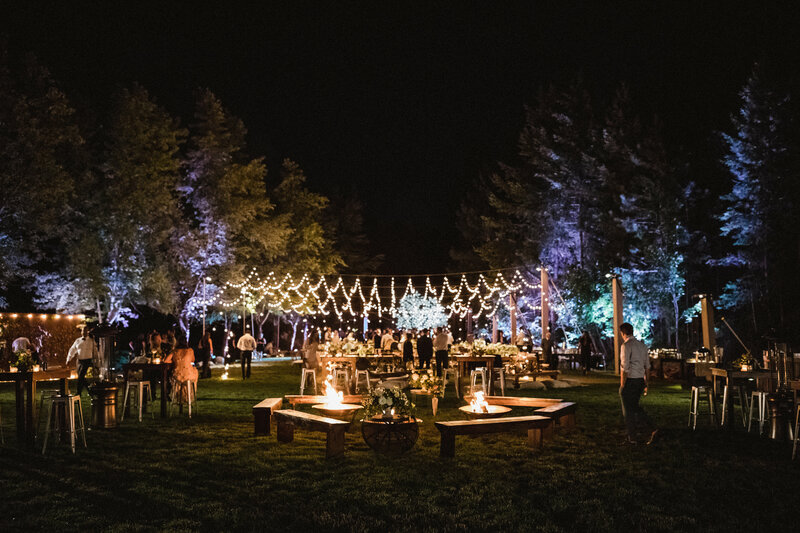 Contact us today to schedule your 2018 events – we already look forward to another great year!